Ford has so many impressively powerful, capable, efficient and comfortable new SUVs that it can be hard to choose just one. 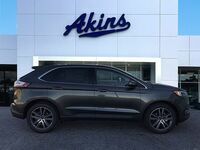 If you’re having trouble deciding which new Ford SUV is right for you, but know you want the midpoint in terms of power, efficiency and interior space, then you’re going to want the 2018 Ford Edge – which we have right here at Akins Ford near Atlanta, GA.
That’s because the new Ford Edge perfectly combines powerful capability with money-saving gas mileage – all while providing you with a sleek and sporty exterior and an interior that’s jam-packed with all the latest and greatest new safety, technology, comfort and convenience features. In other words, the 2018 Edge lineup is the cream of the SUV crop, a point we’ve set out to prove right here with this 2018 Ford Edge versus 2018 Chevy Equinox head-to-head model comparison. 245 HP & 275 lb-ft. Standard Horsepower & Torque 170 HP & 203 lb-ft.
315 HP & 350 lb-ft. Max Horsepower & Torque 252 HP & 260 lb-ft. The table above should tell you all you need to know about the advantages the 2018 Ford Edge lineup holds over the 2018 Chevy Equinox lineup. 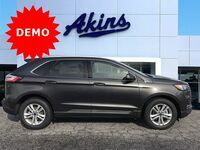 In it, you’ll see the new Ford Edge lineup completely and utterly dominates the new Chevy Equinox lineup in every important category. And, as we love to say here at Akins Ford near Atlanta, GA, it all starts under the hood. In terms of power, it’s not even close when comparing the 2018 Edge lineup to the 2018 Equinox lineup. 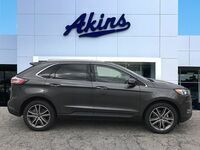 In fact, the standard engine for the 2018 Edge offers more torque than the most powerful 2018 Equinox engine. The 2018 Ford Edge’s dominance over the 2018 Chevrolet Equinox continues when you head inside the two models. 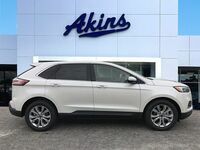 Inside, the new Ford Edge lineup provides 113.9 cubic-feet of total passenger space, 39.2 cubic-feet of cargo space with all its seats in place, and 73.4 cubic-feet of total cargo space. The new Chevrolet Equinox lineup, on the other hand, can only provide 103.2 cubic-feet of total passenger space, 29.9 cubic-feet of cargo space with all its seats in place, and 63.5 cubic-feet of total cargo space. 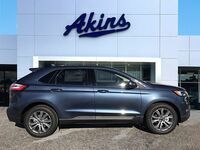 For more on the 2018 Ford Edge, please contact our friendly Akins Ford staff near Atlanta, GA.